Mostly Positive (342) - 70% of the 342 user reviews in the last 30 days are positive. Mostly Positive (32,838) - 77% of the 32,838 user reviews for this game are positive. 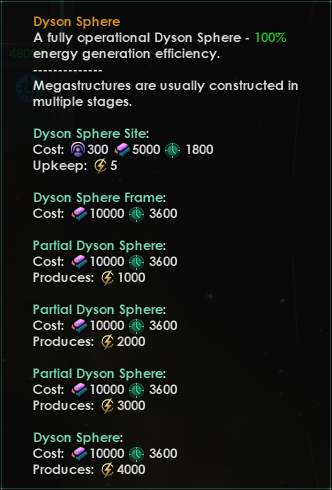 First of all, I’d like to follow up on last week’s dev diary by sharing some more things we’re trying out with Megastructures (and habitats!). After all of that, we also have something new to talk about! Let’s start from the beginning – which of course leads us to the Mega-Engineering technology itself. As always, numbers may not be final and temporary things may be sighted. 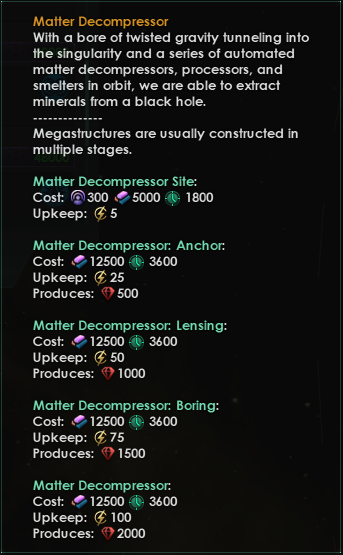 Mega-Engineering is still a rare technology, but will now be more likely to appear as you build more Habitats and Citadels. This means it is way more likely to appear if you are performing actions in the game that would lead you towards the route of building larger and more powerful structures. 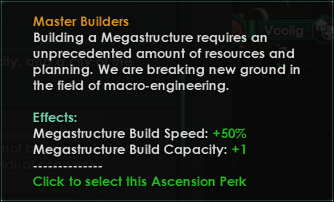 The Master Builders ascension perk no longer unlocks mega-engineering or adds size to habitats, but instead increases the number of megastructures you can simultaneously build by +1. What about increased habitat size you ask? Well, keep on reading! 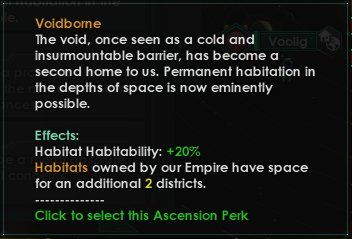 Voidborne ascension perk now increases habitat size by +2 and increases Habitat habitability by 20%. This should mean it becomes more of a choice for specialization, rather than feeling it is a non-choice. As a final note on habitats, it might be worthwhile to reiterate my thoughts that I eventually want to add different levels/sizes to habitats. It is however not something for the immediate future, but a little further down the road. We didn’t quite like how Ring Worlds ended up feeling like a vast farm, so we’re making some changes. Instead of being a size 50 with regular districts, we’re changing it to a size 5 with a unique type of districts – segments. 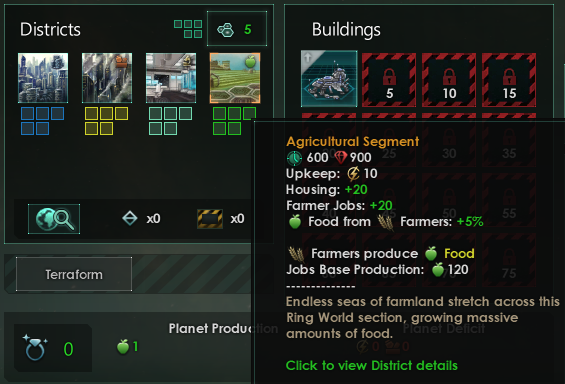 A Ring World, as you know, has 4 planets. 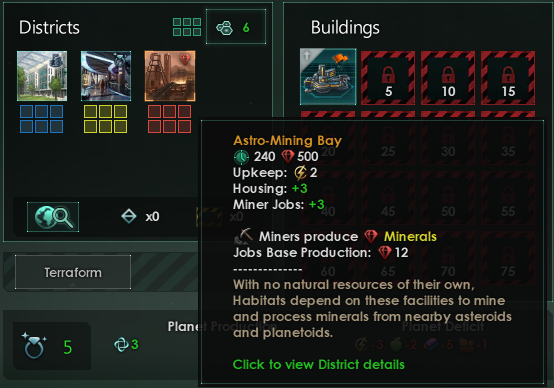 Each planet can now build 5 segments, which are very powerful districts with many jobs and a lot of housing. Some of you might recognize the icon for what was supposed to become arcane technology, that partially got into 2.2. It was something that I was personally working on, but that didn’t work out as I had imagined it, and that I didn’t get enough time to finish with other things taking priority. In the next upcoming DLC, you will be able to come across Minor Artifacts. “Minor Artifacts” is a broad term that includes any smaller and nameless artifact left behind by ancient civilizations. They are never gained passively every month, but will rather have to be found. What are they used for, I imagine you asking? Well, the basic functionality is that they can be consumed in so-called artifact actions. There are a bunch of different actions that can be performed by consuming Minor Artifacts, with varying effects for each. Some of these actions will be locked behind a technology, which some may also recognize. 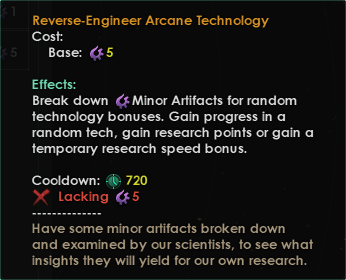 Arcane Deciphering allows you to consume Minor Artifacts for a random technology-related bonus. Utopia: This expansion adds megastructures and new options for the ultimate advancement of your species. Synthetic Dawn Story Pack: Provides an all-new way for players to establish their empire across the stars, starting the game as a Machine Empire -- a society made up entirely of robots. Unique game features and event chains will allow the machines to expand as a robotic consciousness and create an AI-led network that grows to galactic dominance. Humanoids Species Pack: A species pack that includes ten new Humanoids portraits, new ship models, three new voiceovers sets for VIR and three remixed music tracks. 533 Curators have reviewed this product. Click here to see them.